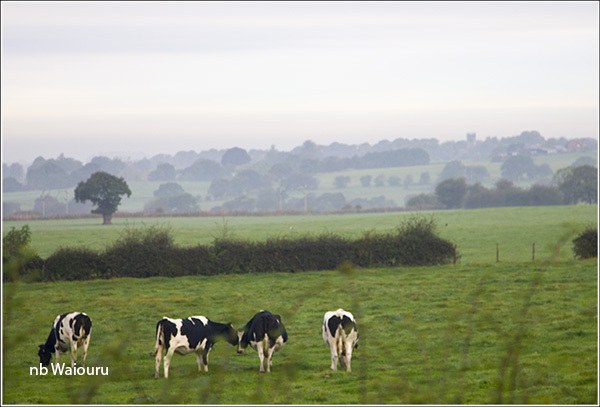 It was a rather misty start to the day. Well actually it was rather misty all day! Jan was scurrying around inside Waiouru doing all the necessary chores whilst I wandered up and down the towpath impatiently waiting. 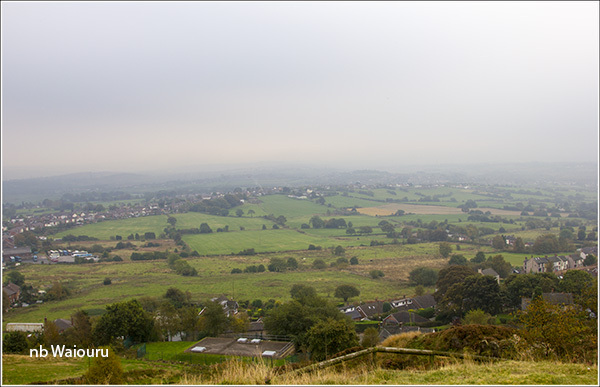 At one point I stood on the gas locker and took a photo to the north across the Cheshire plains. 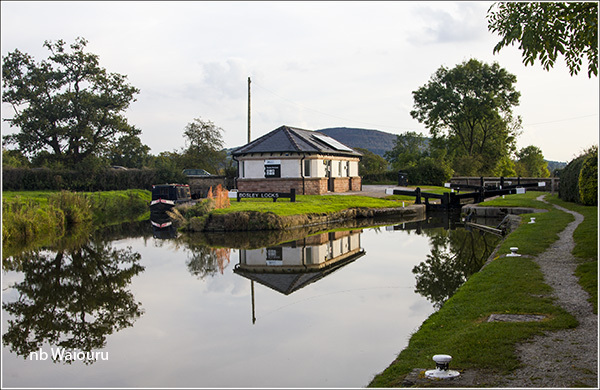 We quietly passed all the moored boats above Bosley Locks at 8.00am and moored on the water point above the top lock to fill the tank. The volunteer lockie arrived as we moored and told Jan to wait at the top because he needed to run water down to the pound below Lock 5 as it was almost empty. A CRT van arrived with two more employees whilst we were waiting. Then a second volunteer lockie arrived. Jan started to get excited thinking she would get help with the locks. Alas she was to be disappointed! Very little help and every lock was against us. Despite this we set of in good cheer settling into a routine where I’d steer Waiouru into the lock and then go forward to set the next. Jan would work me down and reset the lock as I headed off to the next lock. On first glance it appeared to be a simple plan. 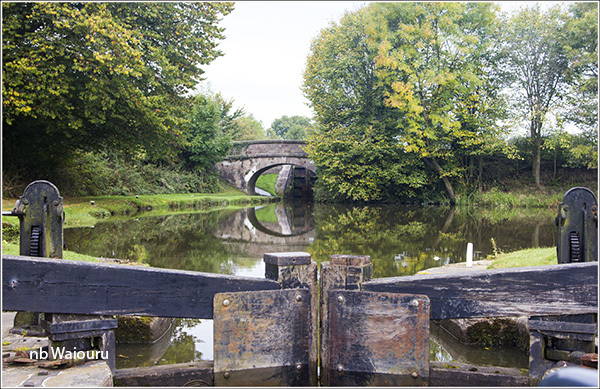 However at Lock 2 I positioned myself square on to the paddle mechanism with legs apart and slightly bent. Then using my arms and thighs I quickly wound up the paddle. I’ve found getting a good rhythm reduces the possibly of a stiff mechanism stalling the operation. Unfortunately not everything went as planned I had completed about four rotations of the windlass when a jet of canal water shot out of the vent between my legs soaking my crutch. I had wet myself and it wasn’t even caused by excitement or fear. Waddling around to the opposite paddle mechanism I positioned myself so I wasn’t astride the vent and quickly completed four turns of the windlass. There had been no rush of water out of the vent so I peered over it and promptly got a face full of canal water. Two face washes in one day. I’m the cleanest boater on the Cut! The locks arrived and departed very regularly and we were at the bottom in just under two hours. Jan said good morning to a man who was walking up the flight with a couple of bags of rubbish. Obviously a boater moored at the bottom of the flight. On his way back he mentioned to Jan that his wife had told him the folly I blogged about two days ago <here> is actually a hunting lodge. 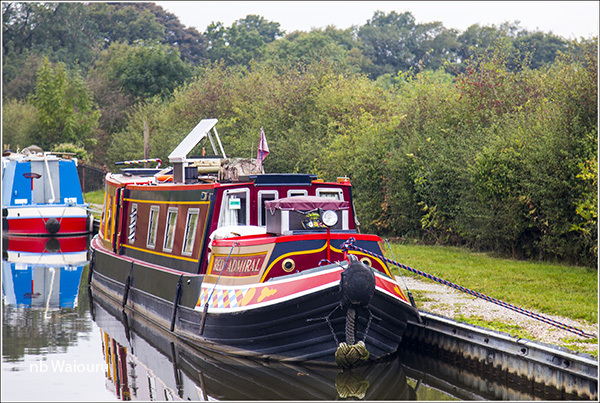 When we reached the moored boats Jan noted he was aboard nb Henry. So now we know. It’s not a folly! We passed nb Red Admiral which we saw last year, but can’t remember where! 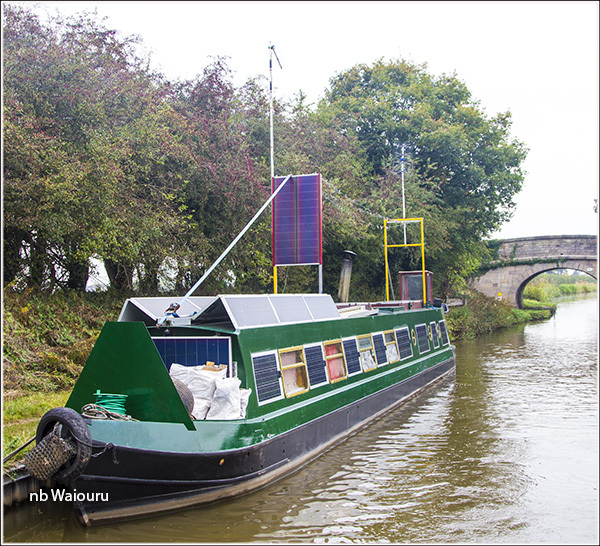 Then we passed the following boat which we definitely remember being moored around Stoke on Trent last summer. It’s covered in solar panels; even on the sides between the windows! Jan was inside Waiouru as we crossed the aqueduct just before Congleton. I glanced to the right and noticed the adjacent railway bridge and took a photo. I shouldn’t be surprised by all these railway bridges as the rail lines usually follow the same general route as the canals. 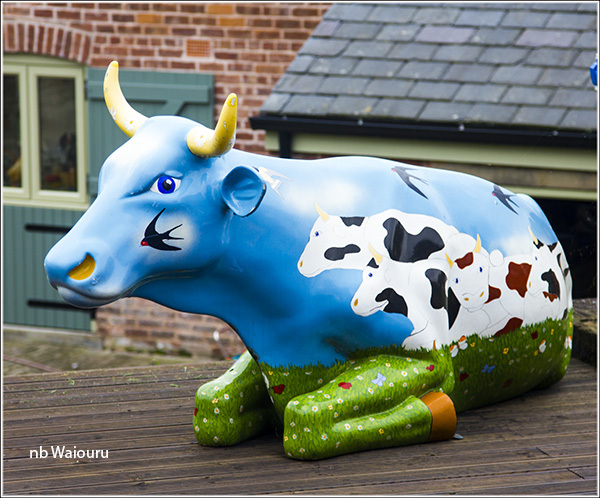 Most of the cows we saw today were standing, but this one was laying down on the job. 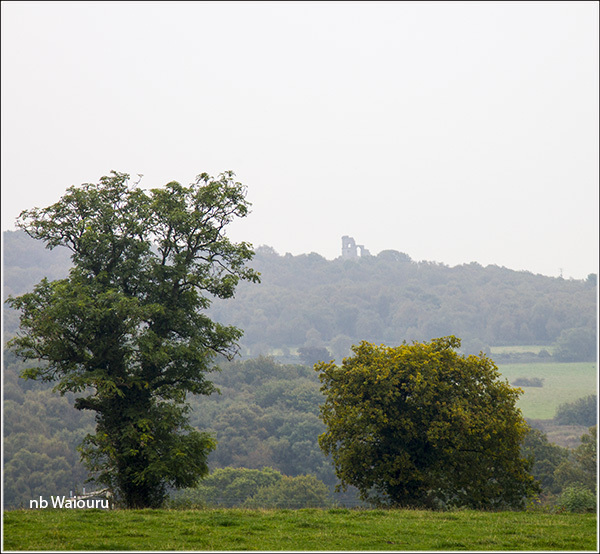 Eventually we could see Mow Cop Castle (got it right this time Halfie) on the skyline and knew we were getting close to our Monday destination. Having difficulty seeing in in the photo above? I’ll zoom in.. The plan was to moor just beyond the Heritage Boats hire base but before we reached there Jan saw the house she wanted. Apparently there is room for a pony, pool and separate cottages for mother and mother-in-law. 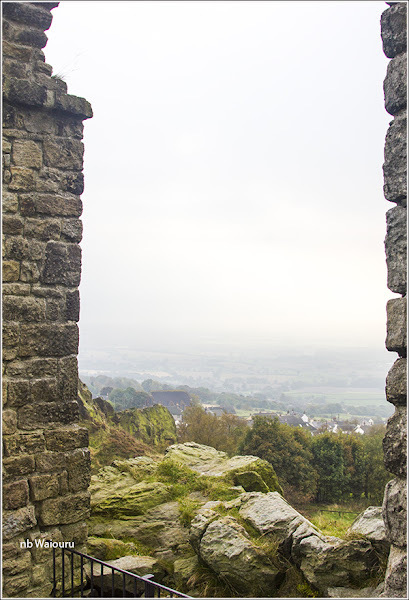 We arrived at our destination at 3.00pm where I made the spontaneous decision to then walk to Mow Cop Castle. It’s not very far from the canal (in a straight line), as my crutch and face had dried it seemed a good idea to do it today rather than waiting until tomorrow morning. The route is a mixture of roads and footpaths with must of it uphill. Good news as it will be easier walking back! I took a slightly circular route (it was deliberate) and happened to stumble upon this nook in a wall close to the entrance to the castle. 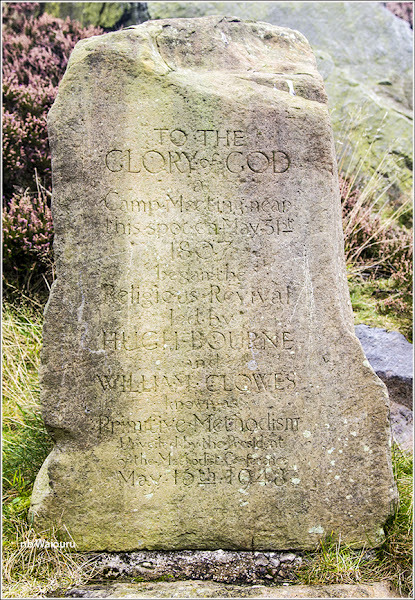 "To do good forget not"
I’ve read other bloggers posts about walking to Mow Cop but I don’t recall any of them mentioning this well? 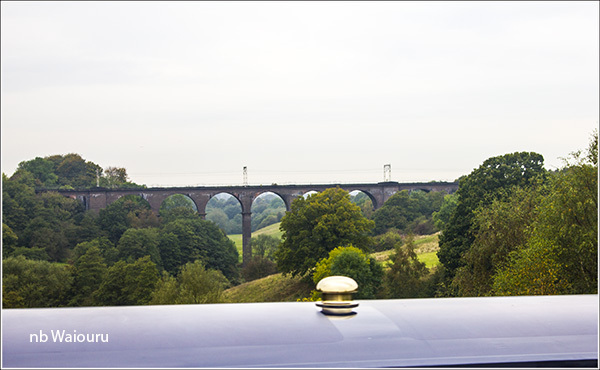 There are splendid views of the surrounding countryside………. on a clear day! 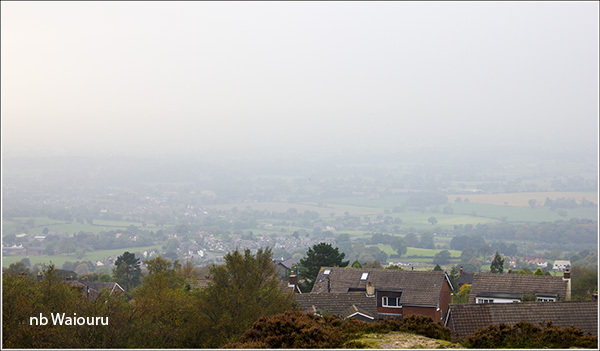 Today wasn’t that day…..
Oh, I forgot to mention the relevance of Mow Cop. It’s all a fake…. One of those English Folly’s. 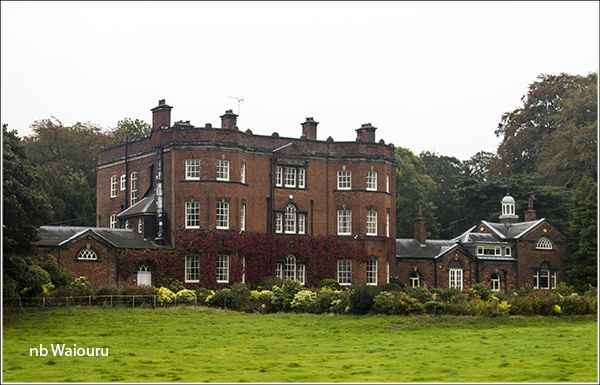 This one was built in 1754 by Randle Wilbraham of nearby Rode Hall. 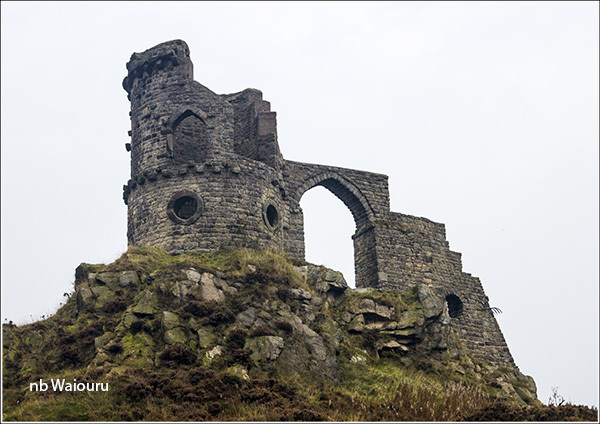 It was apparently constructed as a summerhouse looking like a medieval fortress. 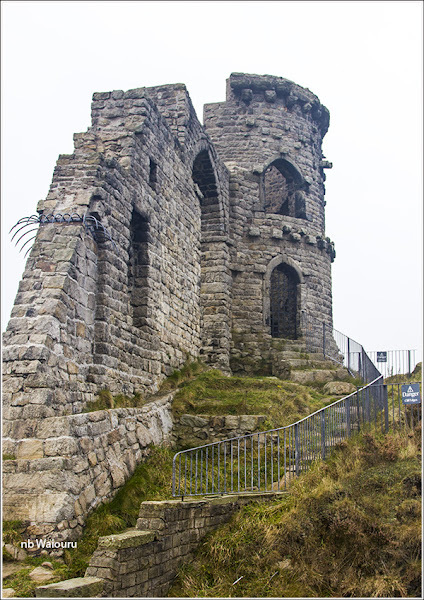 Mow Cop Castle is also famously known for being the meeting place of the first Primitive Methodists and there is a stone at Mow Cop commemorating this event. So all your primitives, this it where it all began. I made it back to Waiouru in time to find Jan had baked me one of her self saucing puddings (orange this time) and was in the midst of seasoning the steak. Tom, we don't remember seeing the well either. Exactly where was it? Did you see the Old Man of Mow tho? Very impressive. Stand on the road facing the lane into the NT carpark. 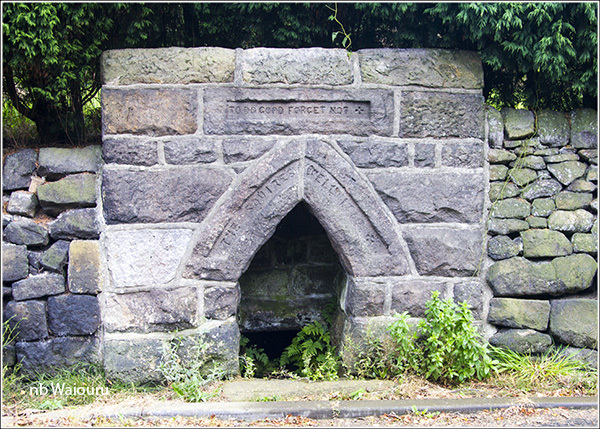 The well is down the road to the left and set into the wall on the uphill side.